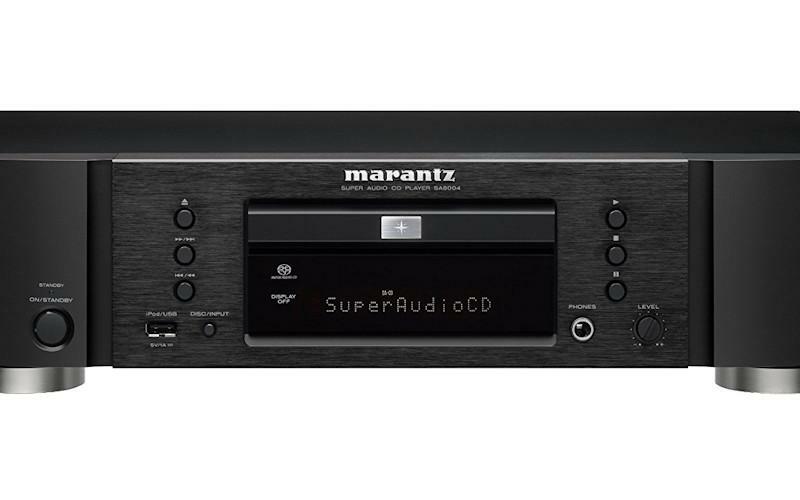 Marantz's latest SACD player, the stereo only SA8004, is reminiscent of a Swiss Army knife (or Leatherman for those who didn't grow up with Swiss Army knives) in that it is flexible and versatile beyond expectation. I have seen the SA8004 marketed simply as a SACD / CD player but it has a few more tricks up its sleeve. • Read more source component reviews by the writers at Home Theater Review. • Find a pair of Bookshelf Speakers or Floorstanding Speakers to pair with the SA8004. • Explore receiver options in our AV Receiver Review section. One look as the outside of the SA8004 and there is no question that this is a Marantz product as it draws heavily from the current line's industrial design with the outer edges of the font panel being made out of a curved polymer material. I have come to expect an emphasis on sound quality form Marantz and was pleased to see that Marantz paid close attention to audio performance in the design of this product. The double layered chassis weighs in at just over 17 pounds and demonstrates the fit and finish that one deserves in a product that plays $999 such as this one. The price is especially impressive when one considers how many design elements the SA8004 shares with its big brothers in the Marantz lineup, the SA-15S2 and limited edition Pearl, not to mention the added flexibility discussed below. The inside of the chassis features too many features to go into here but some highlights include a custom made, Xryon transport tray with a rubberized coating to minimize vibration, HDAM-SA2 output circuits, low noise toroidal power supply, lots of internal shielding, a front panel USB input that can accept a digital stream from an iPod (as well as control the iPod), a rear panel USB Type B input that can accept up 24 bit / to 96 kHz signals, Coax / Optical digital inputs that can accept up to 24 / 192 kHz bit signals, and many more audiophile touches. • The SA8004's ability to bypass an iPod's internal DACs and extract its pure digital signal is a nice bonus. • The SA8004 has digital inputs that can accept 24/96 via USB and 24/192 signals via both its coax and optical inputs. • The ability of the Cirrus CS4398 DAC to accept 2.8224 MHz SACD DSD signals ensures maximum SACD performance. Read about the low points of and competition for the Marantz SA8004 on Page 2.